I'm joining in with Haiku My Heart with recuerda mi corazon. Battle of the Books. This picture is from last year's fifth grade battle, but now we're getting ready for the middle school battle with a whole new team. I'm tempted to say that I don't feel we're ready, but what is ready, really? My goal as coach was that the team members (all girls this time - the Greek Goddesses of Reading) enjoy themselves. So I tried to let myself off the hook from pressuring everyone to read the books. They all heard the announcement from the principal at least once a week reminding the battle team members to read all seven books. I didn't want their battle memories to be of the coach yelling at them to read. They've had practice battles at school now - they should know where we stand. I want our battle team members to come out of the battle feeling like they built closer relationships with the other team members. I want them to remember reading as something enjoyable, not a pressure. I want them to hear next year's battle announcement and say, "Yeah! That was fun! I wonder what the other people I teamed up with last year are doing?" 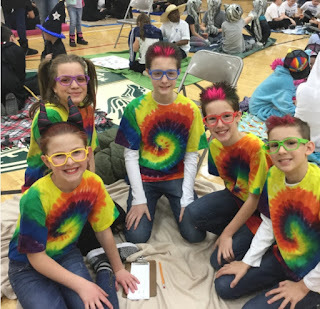 The middle school Battle of the Books is next Friday - wish us luck! Good luck for this coming week and may all your good intentions, diligent work, and camaraderie bring forth more than a win! In my opinion, you are all champions! The most important part is that they enjoy themselves. Go team! Sounds like fun! They have a great coach. Thank you for your heart warming post and FABULOUS haiku! these are the memories we grow up treasuring. kindness, team spirit, encouragement and add to this a life long love of BOOKS!